Below are common attributes associated to Trumpet Honeysuckle. Become a care taker for Trumpet Honeysuckle! Below are member comments regarding how to plant Trumpet Honeysuckle. No comments have been posted regarding how to plant Trumpet Honeysuckle. Be the first! 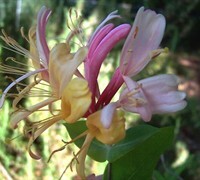 Do you know how to plant Trumpet Honeysuckle? Below are member comments regarding how to prune Trumpet Honeysuckle. No comments have been posted regarding how to prune Trumpet Honeysuckle. Be the first! Do you know how to prune Trumpet Honeysuckle? Below are member comments regarding how to fertilize Trumpet Honeysuckle. No comments have been posted regarding how to fertilize Trumpet Honeysuckle. Be the first! Do you know how to fertlize and water Trumpet Honeysuckle? Below are member comments regarding how to deal with Trumpet Honeysuckle's pests and problems. No comments have been posted regarding how to deal with Trumpet Honeysuckle's pests and problems. Be the first! Do you know how to deal with pests and problems with Trumpet Honeysuckle? Make specific cuts to the plant to encourage growth in the desired direction. If the plant is growing too large, trim the oldest vines and branches throughout the plant. Cut above buds facing in the direction you want the plant to grow. Cut away dead or damaged branches and vines. Make the cut about 1/4 inch above the bud so that the plant blooms the following season. Cut above buds facing in the direction you want the plant to grow. Thin out interlaced and crossing branches or vines. Carefully loosen the tangled areas and cut the branches and vines one by one. Cut off about 1/3 of the live growth.